The device permits rapid, easy and safe occlusion of blood vessels. After positioning the loop with a double passage around the blood vessel (the loop is not included with the device and must be chosen according to the condition that the case requires), the two ends will be anchored at the stylet’s terminal. Once the stylet has been pulled to the outside of the occlusion tube, it is possible to place the loop in traction so to obtain the occlusion pressure desired. At the conclusion of this phase it is sufficient to close the proximal clamp to fix the loop in place. Using this device, the surgeon can maintain complete control on the blood vessel, which also permits the precise administering of heparin locally. 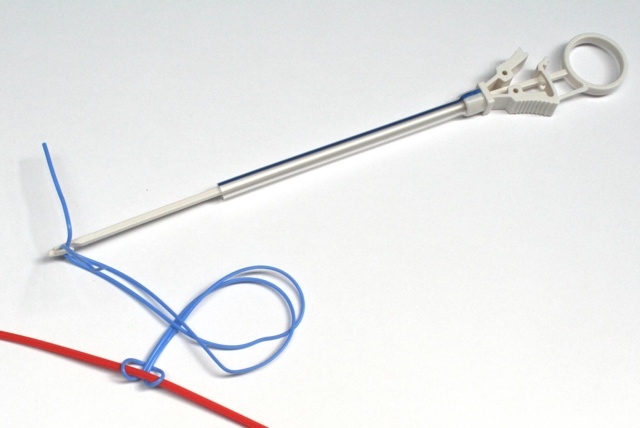 The quick release clamp allows rapid control of blood flow. Various models are available with occlusion tubes in silicone or PVC, with coloured radiopaque line to distinguish between different blood vessels (various arteries and/or veins). All occlusion tubes have non traumatic rounded tips. Available with plastic or stainless steel stylet.